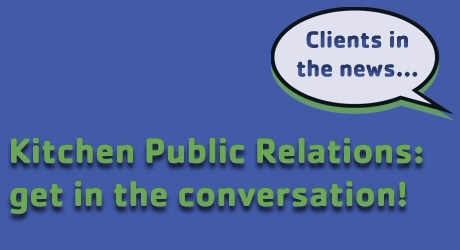 Kitchen Public Relations: get in the conversation! Kitchen Public Relations is an award-winning corporate media relations firm that specializes in helping companies use media relations and social media to raise brand awareness and drive business results. Oct. 1, 2018 - The Chicago Tribune features a story about Firstrade being named a best broker by Kiplinger's Personal Finance. Aug. 7, 2018 - NY1 TV reports on ThinkEco's smartAC kit and the Con Edison SmartAC Program. This year, we introduced a new "pet mode" to support customer concerns about pet safety during the summer months. May 4, 2018 - McCarthy Building Companies' CEO Mike Bolen discusses the booming economy and its impact on construction industry jobs. New York Times: After 7Years of Job Growth , Room for More, Or Danger Ahead? Dec. 8, 2017 - A front page New York Times article features McCarthy Building Companies' CEO Mike Bolen discussing the need for skilled workers and how the company supports training to fill the need. Sept. 22, 2017 - The New York Times feature story about tariffs on imported solar gear quotes Scott Canada of McCarthy Building Companies about the harm it will cause on U.S. construction firms. June 2, 2017 - MRINetwork's Jim Guerrera, president of the SC Novi, talks with reporter Patricia Cohen about the labor market and the need for skilled workers. April 29, 2017 - CBS News aired a feature story for our pro-bono work on the documentary film Near Normal Man. The film tells the story of a 95-year old Holocaust survivor told in a first-hand account by Ben Stern, a Polish Jew, who survives 2 ghettos, 9 concentration camps and 2 death marches. He emerges alive, only to face the Nazis again – 30 years later, this time in Skokie, Illinois. December 23, 2016 - Avangrid's Juanita Washington shared energy saving tips on Good Day Rochester Friday along with some information on EnergyHub's demand response program for Utilities RG&E and NYSEG. November 22, 2016 - Waste 360's Arlene Karidis talked to Recyclebank Executive Vice President Paul Winn about the organization’s evolution. October 21, 2016 - George Spencer details how Kitchen Public Relations, along with the American Bus Association(ABA), successfully helped an ABA member get through a crisis situation. Copyright 2011 Kitchen Public Relations. All Rights Reserved.